Brea is a young Canadian artist whose body of work reflects her personal search for meaning. Try to mesh country, pop and a little rock, and you'll have an inkling of this young lady's style. She has just released her third CD produced by Juno Award Winner Keith Glass (Prairie Oyster) and is scheduled to play at The RBC Ottawa Bluesfest 2012, TWICE! July 5th she will perform on the Offsite stage at The Casino du Lac-Leamy as a part of The 2012 line up for The Ottawa Bluesfest @8pm. Also, dont miss her on The Barney Danson Theatre Stage - July 8th @2pm as she promotes the release of her third CD, 'Somewhere To GO' at one of the Premier Festivals in Canada, The Ottawa Bluesfest! Her extraordinary vocals, her passion and her unique writing style put her in a class all her own. During her career she has gained a loyal following of fans that identify with the things that have become important to her. As the National Spokesperson for the Canadian Red Cross - RespectEd program, Brea tours western Canada each fall, performing and speaking to students in schools about the affects of bullying. Her second album "no regrets" was produced by Ottawa's Joe Turner and UK world renowned Producer, Stu Epps. Stu is well known for his work with Elton John, Led Zeppelin, Bill Wyman, George Harrison and many more. 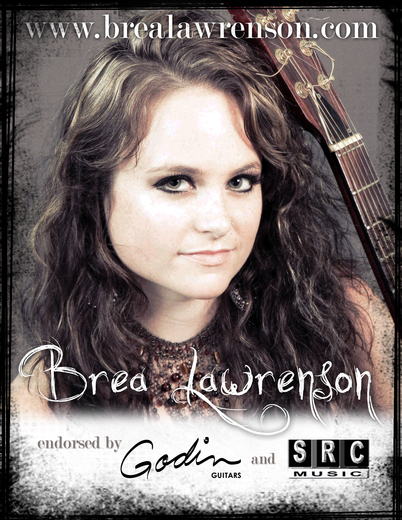 Brea has continued writing with many talented writers including Country Hall of Fame, Barry Brown, Brea has dedicated much of her childhood to music and wouldn't change a thing. She has accomplished more than some people only dream of and if you ask her she’ll tell you … "it’s been worth every second…I have "No Regrets." Brea just completed another video for her song "If I'm Not Here Tomorrow" and dedicated it to Military Men and Women everywhere, with the greatest respect. It can be viewed on her websites as well as on Youtube.